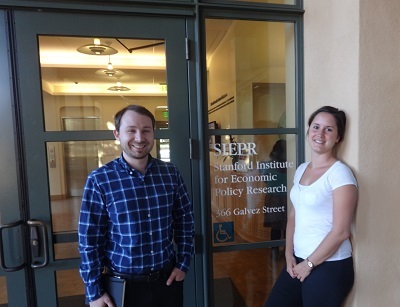 From March 5-6, 2015, our doctorate students, Anke Schulz and Philipp Staiger, visited the Stanford Institute for Economic Policy Research and participated at the National Bureau of Economic Research (NBER) Meeting on the Economics of Digitization. The digitization tutorial and subsequent conference which in turn lasted one day each, provided the young researchers with insights into the cutting edge research of the field’s key figures, most notably Erik Brynjolfsson (Massachusetts Institute of Technology & NBER), Susan Athey (Stanford University & NBER), Heidi Williams (Massachusetts Institute of Technology & NBER) and Shane Greenstein (Northwestern University & NBER). On a more informal note, the speakers, participating Ph.D. students and other affiliated guests engaged in a vibrant exchange over coffee and lunch breaks. The ISTO team and especially our doctorate students are excited to be a part of this newly emerging, politically relevant research field and are looking forward to a fruitful collaboration with the NBER meeting’s participants.